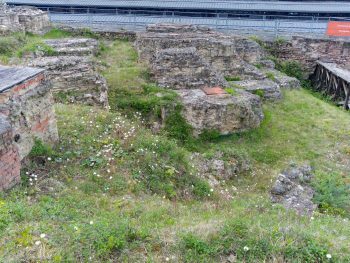 The Roman stronghold or castrum Mogontiacum, the precursor to Mainz, was founded by the Roman general Drusus perhaps as early as 13/12 BC. 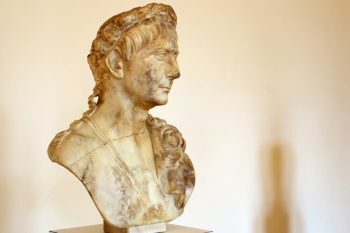 As related by Suetonius the existence of Mogontiacum is well established by four years later (the account of the death and funeral of Nero Claudius Drusus), though several other theories suggest the site may have been established earlier. 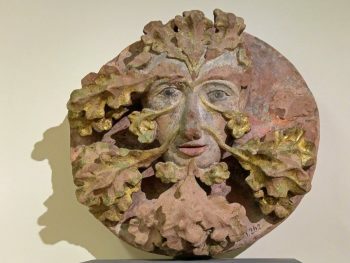 Although the city is situated opposite the mouth of the Main river, the name of Mainz is not from Main, the similarity being perhaps due to diachronic analogy. Main is from Latin Menus, the name the Romans used for the river. Linguistic analysis of the many forms that the name “Mainz” has taken on make it clear that it is a simplification of Mogontiacum. The name appears to be Celtic and ultimately it is. However, it had also become Roman and was selected by them with a special significance. The Roman soldiers defending Gallia had adopted the Gallic god Mogons (Mogounus, Moguns, Mogonino), for the meaning of which etymology offers two basic options: “the great one”, similar to Latin magnus, which was used in aggrandizing names such as Alexander magnus, “Alexander the Great” and Pompeius magnus, “Pompey the great”, or the god of “might” personified as it appears in young servitors of any type whether of noble or ignoble birth. Mogontiacum was an important military town throughout Roman times, probably due to its strategic position at the confluence of the Main and the Rhine. The town of Mogontiacum grew up between the fort and the river. The castrum was the base of Legio XIIII Gemina and XVI Gallica (AD 9–43), XXII Primigenia, IIII Macedonica (43–70), I Adiutrix (70–88), XXI Rapax (70–89), and XIIII Gemina (70–92), among others. 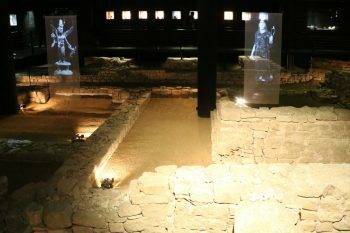 Mainz was also a base of a Roman river fleet, the Classis Germanica. Remains of Roman troop ships (navis lusoria) and a patrol boat from the late 4th century were discovered in 1982/86 and may now be viewed in the Museum für Antike Schifffahrt. A temple dedicated to Isis Panthea and Magna Mater was discovered in 2000 and is open to the public. The city was the provincial capital of Germania Superior, and had an important funeral monument dedicated to Drusus, to which people made pilgrimages for an annual festival from as far away as Lyon. Among the famous buildings were the largest theatre north of the Alps and a bridge across the Rhine.